Which Milkweed Species Grow Well in Containers? Container gardening ideas for your monarch butterfly garden consist of both nectar flowers and milkweed plants. Even better, are the butterfly plants that serve both purposes. But why would you want to grow milkweed in a container? Put pots on raised beds, move them around in the garden, or bring containers to a patio for easier viewing of butterflies and caterpillars. When you raise monarchs on a potted plant, you don’t have to constantly switch out their milkweed supply. However, make sure if a pot has been sitting outside that you thoroughly check the leaves and container for hungry predators! The California Butterfly Lady suggests disinfecting your container plants (and rinse thoroughly) if you plan to reuse them for raising or gardening over the season. Use Disinfecting Wipes on the leafless stems to help stop the spread of OE Disease. If you grow non-native milkweed varieties, you can buy new seeds/plants annually or you can overwinter in containers. This gives you larger plants to start the season and also saves time and money getting new plants started. This works best with Asclepias curassavica (tropical milkweed) but milkweed growers have also reported success rooting butterfly weed, swan milkweed, and the calotropis milkweed varieties. This is probably the best option if you want to stick with natives varieties. 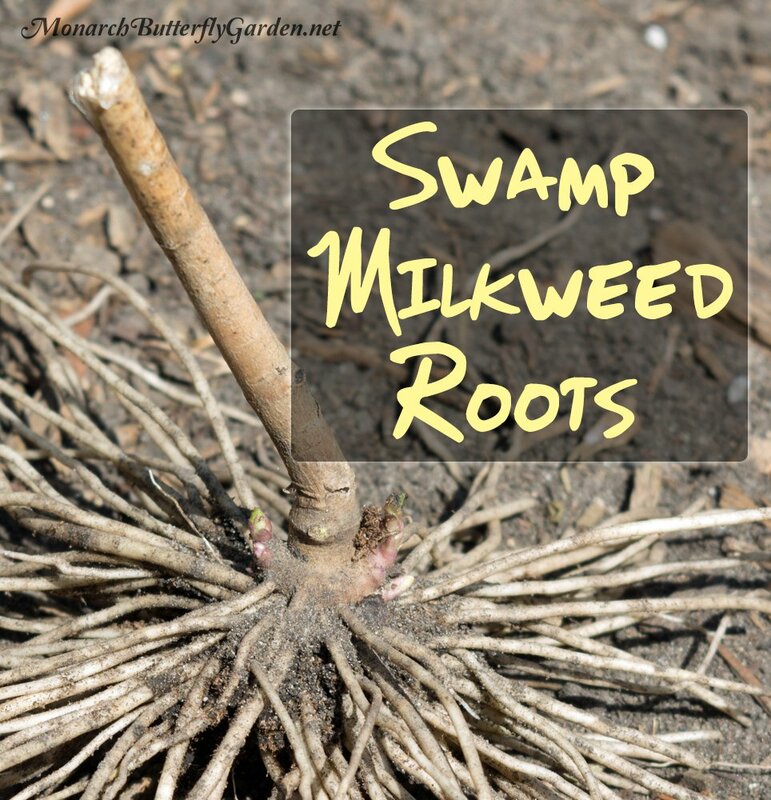 Each fall, leave a couple inconveniently-seeded first year swamp plants in your garden and mark them. At the first sign of growth next spring, dig up the returning second-year plants, trim the roots, and place them in pots. Incarnata doesn’t have tap roots, so it’s easy to dig up and replant. It’s also a favorite host plant and nectar flower for monarchs. The advantage to using second year plants? Several stalks will emerge and your container will have a long bloom period in summer. Asclepias curassavica blooms all season long so it works great in containers. It also grows shorter than swamp milkweed so a potted plant will fit better in a large caterpillar cage, should you decide to raise monarchs. In our northern garden, we typically use potted tropical milkweed once to raise monarchs to release for the fall migration. Make sure to take the disinfecting precautions listed above if you reuse potted plants in the same season…this goes for any milkweed variety you are reusing. This is an exciting native option for containers because it blooms repeatedly with pretty white flowers similar to swamp milkweed. Perennis leaves also stays viable for monarch caterpillars throughout the season. Suggested for USDA hardiness zones 6-9. This widely used native milkweed has more compact growth, although it does have underground rhizomes, so I would suggest using a 10″ pot or larger, depending on the size of your plant. This is the only milkweed with true blue flowers and a beautiful container option. It’s a climbing vine, and I’ll be sure to report our experience growing it in year 2. I would not recommend depending on this variety as a host plant, although it is a viable milkweed option for monarch caterpillars. This native climbing butterfly plant can be an aggressive spreader, so why not try it in a container so you can reap all of the milky benefits without the hassle of runaway rhizomes? This does not spread aggressively in my northern growing experience. We are currently growing its closest milkweed relative, Gomphocarpus fruticosus (swan milkweed), and that variety does seem to have more aggressive tap roots…go figure! Best Soil for Milkweed Containers? Keep in mind there are over 25 varieties of milkweed you could plant, so research to see if a particular milkweed variety has special soil requirements. For the most part, using an all purpose soil mix works well for most milkweed species. I use a slow release fertilizer to give the plants extra nutrients. This does not hurt the munching monarch caterpillars. You can try growing any milkweed variety in pots as long as the container is large enough to accommodate the rhizomes/ tap root. Think about how long you will be growing milkweed in a particular container…will it be for just one season, or the next several? For our annual milkweed containers, we use 10 or 12 inch pots. Consider a 14″ container for perennial containers…replant in a larger pot when the need arises. Milkweed Container Tip- Select milkweed species that are hardy to at least one USDA hardiness zone below yours. Fence and mulch to keep plant roots from freezing. When leaving containers outside over winter, using large, thick containers with more soil volume will protect the roots better than a small pot. 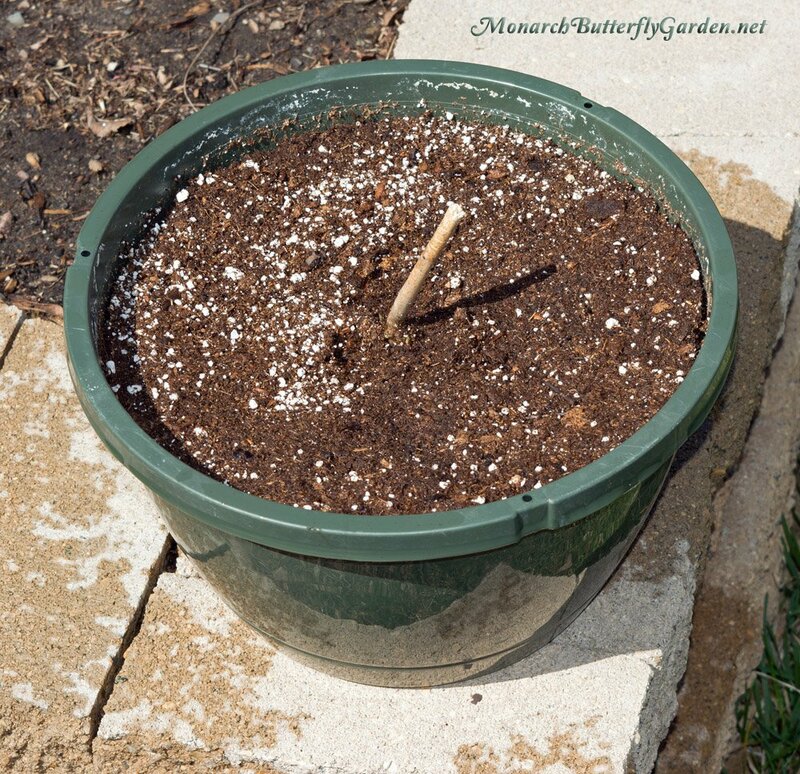 Larger pots will also retain more moisture for your milkweed plants. Use large stones at the bottom of your containers to keep them from blowing over and to give your milkweed pots good drainage. What type of Soil should I use in a pot for milkweed? Potting soil or Garden Soil? 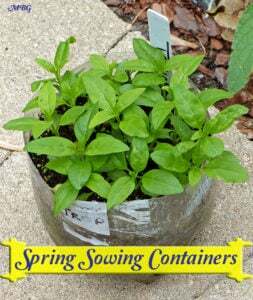 Thank you for the information about growing Asclepias in a container. The wood chips are a concern because they rob the soil of nitrogen as they break down. The nutrient situation in a container is already a bit difficult to balance. I would like to plant aquatic milkweed for Monarch butterflies. However, I am reading that some varieties are poisonous. Exactly how poisonous is the aquatic milkweed Friday? For example if I planted in my front yard and my dogs did not have access to that area, would there be any way that the seas or anything like that could potentially find their way to the backyard. Via Seeds and wind etc? Or would it be safe to say that as long as I keep them separated. My dog should be fine? Going through most of your articles about Monarch butterfly gardening has made the job so easy for beginners like my wife and I . The other day she suggested using wheelbarrows/carts instead of using containers for the milkweed. We have been using wheelbarrows/carts for the past couple of weeks and I must say its working better for us more than the containers . we are using three of the GORILLA CARTS GOR4PS POLY GARDEN DUMP CART as suggested by a friend and it’s proving to be quite efficient . It is easy to assemble, has good maneuverability and has a sizeable ground clearance level. Moving it around the garden and to the patio with Its padded handle makes pulling the cart easy. We get to use less effort since pulling a cart is better than lifting out containers moving them around considering ours are quite heavy and wide and the grounds we have to spread through are wide. If you are having a hard time moving your containers ,you can actually try this carts or look on over the wheelbarrows as well . My wife and I are truly greatful for your website .It has been of much help to us . For growing A. Incarnata in containers at my condo should I use “moisture controlled” potting soil, or since it is SWAMP M.weed would the regular all purpose potting soil be better? Hi Vickie, we are in a region that gets a lot of rain (Minneapolis) so we have used regular potting soil with good results. So glad I found your website; you have some GREAT info! I live in a suburb of Chicago in a second floor condo unit with West facing windows so container gardening is my only option. If I use a really big pot and grow lights could I grow A. Curassavica continually? It’d be nice if I could get monarch cats/eggs from along the roadsides and then raise them inside with my own milkweed supply. 2) should I bring it inside and let it grow at room temps through the winter? Hi Vickie, Incarnata grows best in cold climates. I’ve seen swamp plants growing in continuous growing climates and they don’t look happy. So, I would definitely leave it outside…it’s hardy to zone 3.
my swamp milkweed is in containers. the combination of moist soil and brisk wind is blowing the plants over and the roots are becoming exposed. these are transplants about 6 weeks old and 24″ high. any suggestions? Hi Greg, I would move them to a more wind-protected area until the weather improves…good luck! Hi Tony, I have tropical milkweed cuttings from last fall growing indoors. They’re doing great but I’m wondering if I should pinch them back to encourage growth of multiple shoots thereby making the plant bushier. I thought I read that somewhere. Is that a good thing to do? Thank you! Hi Sue, you can pinch back the top leaves to encourage bushier growth. Maybe try it on a couple plants to compare and see what you prefer. Another reason for growing them in containers is wintersowing more seeds than there’s room to transplant in a garden. I know that established common milkweed has big roots, and is probably not a good choice for growing in containers. However, I decided to “winter sow” a tray of seeds from a pod, that I put in my cold frame last January. I swear I got about 400-500 seedlings! All are still very small, just getting their second sets of leaves. Even though they’re small, they grew before my established plants came up, which I’m glad for, since monarchs have been sighted in towns up my way. I’m keeping some of the common milkweed seedlings inside at cold nights, hoping they’ll grow faster than the ones I can’t bring in. (I have 130 in a wheelbarrow of compost, 60 in a large rectangular container outside, and a couple dozen in each of two large pots — in addition to a whole lot that are still left in the tray that I bring inside and even sometimes on my kitchen radiator grille. So I’ll probably sacrifice these baby plants for caterpillars instead of trying to find a permanent place to transplant all of them. Winter sowing worked really well for them. Too well! Hi, I have lots of Aschepias curassavica milkweed seeds. 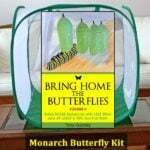 I would like to share with others who want to get started growing them for the Monarchs. I have them planted them every where. I could send pictures if anyone wants to see them. Plus I have pots of milkweed growing good… They are from my last year milkweed from seed pods. They are yellow/gold in color. If someone wants to give me there address I will put some in an first class envelope. I live in Virginia Beach! Lots of mine came back from last year! Hi Anissa, some people grow common milkweed in containers, but I’m not sure how happy it is. We just grow ours in a section of the garden away from other plants. If you want to plant tropical milkweed just soak the seeds in water for 24 hours to soften the seed coat and then direct plant outdoors in the garden or a pot…good luck! I have a friend who said he could give me some common milkweed seeds from the plants in his backyard. I’m super excited, but I don’t want it to take over my garden. Is it impossible to grow it in a container, or would it not do well? Would something like tree roots keep the rhizomes from spreading as far as long as I harvest the seeds? Also, I have been giving tropical milkweed seed pods to my friends, since they were interested in growing them. Since we don’t have seed heating mats or seed starting soil (my dad doesn’t see a point in buying it, at least) would putting the seeds in potting soil and on top of a fridge work alright? In addition to the tropical milkweed that I have grown several years, I managed to start one Gomphocarpus physocarpus (balloon or Family Jewels plant) in the spring of 2015. It grew in a pot in the garden all summer. Tiny seed pods were forming when I brought it inside for the winter. Two of the pods ripened and produced seeds. I didn’t expect much from them, but I soaked them for several days, and they have germinated and are growing nicely. The mother plant has been covered with flowers all winter, with only the light of an east window and a couple of small plant lights on a timer. Cuttings from the mother plant rooted and are growing well. We’ll be growing a lot of this variety in containers for 2016. It’s December 14 up here in the U.P. of Michigan . Is it too late to begin experimenting with cuttings from natural milkweed growing near my house? That is, nip off some 4″to 5″of stems from standing plants, prune leaves and place stems in water containers inside a warm room to see if any root development takes place. We are into winter now but I believe some plants are still standing. Hi Betsy, swamp is on a growth cycle for flowering and seeding so you don’t want to get to far ahead of that cycle or the monarchs may bypass your milkweed when they arrive for fresher plants. Also, swamp milkweed doesn’t have underground rhizomes, so it won’t spread like common. If you don’t want it to seed, tie organza bags over the pods or cut them off prematurely. If you want milkweed varieties that can host monarchs in year 1, you’re better off with tropical milkweed or the fast growing gomphocarpus varieties. Great advice! I am very familiar with winter sowing and already have jugs with dirt in them awaiting seeds! I will plan to do it on that Sunday. 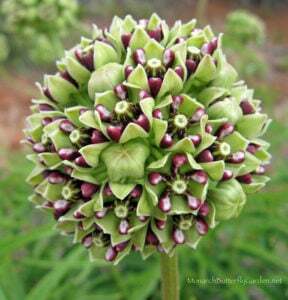 I do have tropical milkweed seeds so will do containers with them. When should I start those seeds? Good luck with your winter sowing! Thanks Tony, I am elated to share with you after 24 days I was able to witness a beautiful Monarch (Male) Butterfly emerge. I was able to video and photo and knew I had witnessed a miracle. I currently have 3 chrysalis in different stages outside on my balcony. About 15 Caterpillars in different stages on my Milkweed (which is in containers). I will continue to keep my “Butterfly Garden” outside in potted plants throughout the year. Some of the Cats crawl down from the Milkweed and onto the dirt throughout the day and then crawl back up the Milkweed. They stay very still and then go back to Milkweed. I am tempted to get them back to Milkweed as they are crawling over the chips in soil. Why do they come down from Milkweed onto soil and back to Milkweed? Hi Debbie, it sounds like they are coming down to molt (shed their skin). As long as they return to the milkweed and resume feeding, this is fine. 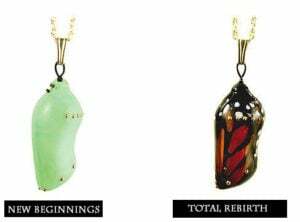 On the 5th molt, they will hang upside down to form the chrysalis. Have milkweed plant outside in planters on porch in Manhattan Beach, Ca. Monarch Chrysalis jade green since 10/28 or 10/29/15. Monarch still has not emerged is it dead? Still jade green. Four new cats on milkweed in 4 stages. Biggest cat crawled onto side of container 3 days ago and has not moved. Should I leave alone or move back on milkweed plant? Keeping plants outside in pots and cats eating away. Temp is getting cold and windy here. It takes forever for the milkweed seeds to grown. I planted them in pots in May and they are only a few inches high. Should I leave them out in the pots over the winter, bring the pots in the house, or transplant the little milkweed plants in the ground right now????? Not sure what to do. I do not know what type they are. The pods are quite large. Hi Bev, if they are native or perennial to your region I would fall plant them. The only milkweed I overwinter indoors are the varieties that won’t survive our winters. good luck! I am a complete newbie in regards to milkweed, Monarchs and nectar plants. Since I quit smoking I have been substituting plants with what I would’ve spent on cigarettes. At any rate, two weeks ago I took 10 seedpods from a milkweed plant all alone on the side of the road. I have harvested seeds from 7 of the pods so far, yesterday I ordered 3 swamp milkweed and 2 butterfly bushes. I have already planted in my gardens lantana, black-eyed Susan’s, coreopsis, blanket flowers, lavender, snapdragons and I have New England Asters, catmint and salvia in pots. Springtime I am planting a “pollinating mix” in a spot to be planned. 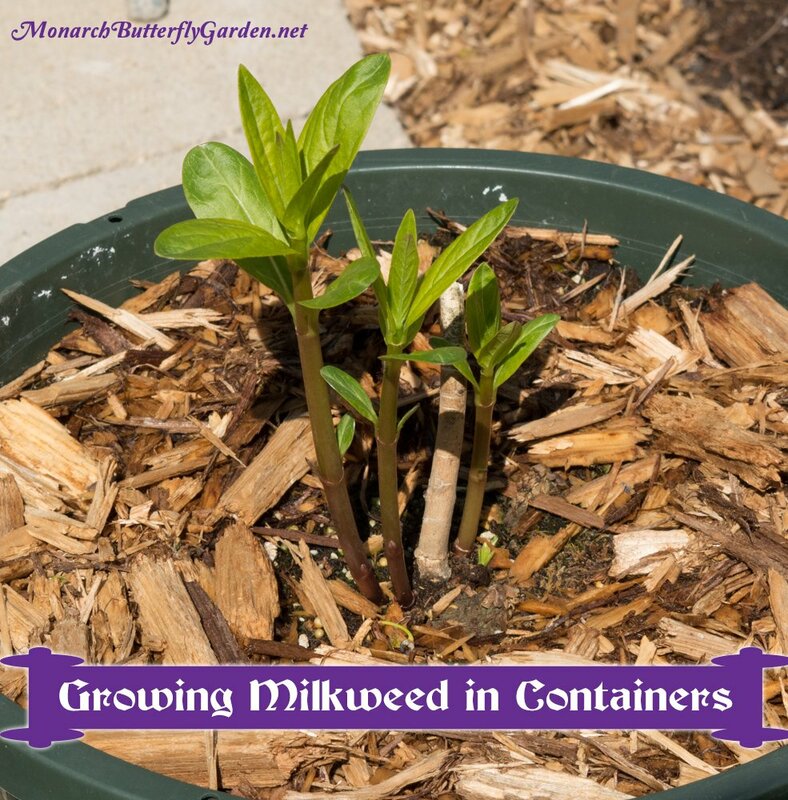 I very much like the idea of container growing milkweed, especially with a nectar plant and I am not exactly sure when would be a good time to start. After the first killing frost in containers, the same time frame of sowing into the ground? Thank you, and yes your advice helps tremendously! I have decided to pot my three swamp milkweed so I can move them around to different garden areas and pollinators I will plant common milkweed seeds (after the first killing frost?) in pots and see what happens, as well as direct sowing and also trying theWinter-sowing technique. I have tons of pollinating seeds to plant next Spring. Hi Ruthann, it’s always a good idea to try a few germination techniques in case one doesn’t work out for some reason. Planting seeds after the first killing frost should work out well…you just want to plant them late enough so that they don’t germinate this fall. good luck! Hi Tony, I am having a problem with spots on my tropical milkweed then the leaves turn yellow. I read it was a fungus from the dirt. Is this true and do I have to dig them all up and lay down new soil. I pick the leaves off but it still goes to the next leaves up the plant. On a side note I did release 25 monarchs in March/April. I have none now and no eggs. I have not laid eyes on any monarchs flying around. very sad. Congrats on all your early season monarchs! Hey Tony, I’ve got Subulata, Tuberosa, Currasavica and Pine Leaf in the garden right now. Seeing a few Monarchs and a couple of Queens but they don’t land on the MW….yet. Is this normal? Of course Arizona is a litttle different (like it gets Hot!) but did you have to wait a year or two for the butterflies to find you…like after you got your MW established? Mine is all pretty new this year although the Tropical MW came from last year…. Hi Joe, it can take them a little time to find you, but having several varieties available should help speed up that process. Monarchs also don’t mind laying eggs on small seedlings. Since you live in a hot climate, I would suggest planting some milkweed in partial shade. The butterflies (and your plants) might prefer it. Good luck! I have only seen 2 Monarchs in the last 3 years. Last fall, I decided to start growing milkweed and learn as much as possible about raising Monarchs so I could do my part in 2015. Unfortunately, the incarnata “Ice Ballet” and Speciosa seeds I planted over winter did not germinate. Part of the seeds were winter sown in 1-gallon water jugs outdoors and part (after stratification) were planted indoors under fluorescent lights. However, I also obtained some tropical milkweed seeds last fall, thanks to your advice, so I’m not completely empty-handed this season. Those seeds germinated quickly and grew beautifully indoors over the winter months. Most of those plants have been transplanted into the garden and are getting ready to bloom now but I’ve reserved a few plants for growing in containers on my deck. In the meantime, will keep trying to get some perennial milkweed started. (Thinking new seed from a different seed source might be in order). Butterfly Lady in Kodak, TN. I have raised milkweed in pots for years. Hi Lois, Thank you for sharing your experience growing milkweed in containers. Hopefully you will see some monarchs soon! Please advise! I live in Florida, the 10b gardening area. I recently screened in a large (sterilized/bleached) bird cage & have raised approximately 50 pupae. To date 26 have morphed however, 6 have been deformed (curled & unable to fly). I read about OE & have taken out & euthanized the last 3 babies, removed & sequestered the plants, bleached out the cage again, but the U of MN literature didn’t explain how to get rid of the spores or the parasite. I certainly don’t want to infect the remaining 40 plants, or potential offspring–although it may be too late for that. Hello, sorry to hear you are having issues with OE. Oe spores are ingested by caterpillars and that’s how it spreads. Could it be your milkweed supply that has OE spores? If so, that needs to be disinfected (and thoroughly rinsed) before using to raise more caterpillars. Thanks for your reply. Bear w/ me please, as I am not quite sure what to use to disinfect the milkweed. I purchased them (20 at a time) from a reputable nursery who assured me they were organic. Four to 6 were in the cage at a time & I rotated them out to regrow. Should I spray all the plants w/ bleach? If so, what dilution? Peroxide? The dozen or so plants that the 50+ caterpillars chewed are in another sunny location re-leafing (I will bring them in until I get a response). I know spores can be incredibly resilient. Do all of the plants need to be repotted in fresh organic potting soil? Many thanks for all ofyour assistance! Hi again, OE is a major problem in your region extra precautions are needed to stop the spread of OE compared to our raising process up north…using the wipes suggested in this article or spraying down the plants after use with a 10-20% bleach solution should kill more spores than if you just used water. You might also want to consider a different cage that’s easier to disinfect…good luck! Ok, I’ll keep trying, I grow butterflies have too much years, and monarch here almost not have like before, people here do not like asclepias curassavica, and after I begin search for others milkweeds and found too acer tree that I loved too, and I’m growing here this trees, and now is autumn and some trees are too much beautiful with color for almost 3 months, my quercus is begin now turn color, I have faith, if somebody have samething that help me will be aewsome. Thank you soo much Tony, congratulations, it’s a beautiful work. If I have something new to share I’ll come back. Last year we had a swamp milkweed in a pot on our deck. We had 13 chrysalis hanging around the edge of the pot . One morning we saw a female Cardinal take one off and come back for another one . We decided to take the plant into our 4 season porch and we raised a total of 22 Monarchs on that one huge plant. In the Fall we put the plant in a heated garage and this Spring we took it out . It is now about a foot tall and growing . We were very surprised to see a bird take the chrysalis as we thought birds didn’t eat them. I called a Monarch expert at the UMN Karen Oberhauser and she had a couple of other people call with the same complaint . yes, there are dangers during every phase of development and it seems like new predators are being discovered on a regular basis. Chalcid wasps also lay eggs in monarch chrysalides. I saw that some species grow in hardzones 9, like Florida, like syriaca. And here where I live is the same wheather. And if I put roots in frige? A. syriaca is supposed to grow in zone 9 (based on hardiness zone designation) but I’ve never talked to anyone that has reported thriving common milkweed in south Florida. Unless you have access to a controlled growing environment (greenhouse), it is going to be difficult for you to grow “mature” common on an ongoing basis. If you try planting outside, I would suggest giving these northern varieties partial afternoon shade. You could contact a grower with a greenhouse in your region to see what they recommend for growing plants that prefer northern climates. Good luck! Helo everybody, I have a lot of questions about milkweed in Brazil. I’m growing here asclepias curassavica, incarnata, cancellata, fruticosa, verticillata, speciosa, purpurasens. And other species are in cold stratification yet: variegata, hirtella, tuberosa, amplexicaulis, fascicularis, viridis and exaltata. I had for two years sulivant, syriaca, tuberosa, purpurascens, speciosa and they never bloom, and they die. These species just one survive, I founded one piece of root and plant in other pot, in this pot I put in different soil, this provide more air to roots, so have three years that I have this speciosa, they never grow like that, it’s so much beautiful, but do not looks that will bloom, what I do? I recently found one piece of purpurascens root, and I’m doing the same way, but I’m afraid to lost, this seeds was dificult to me got. After I do other questions. Hi Francisco, the milkweed species that you are having problems with don’t grow well in warm weather regions like Brazil, and their growth cycle includes a winter dormancy which your climate will not provide. We are having great success with container grown milkweed–three plants per 12-inch container.. We are in Florida. We left the containers outside till we saw eggs on the leaves, then brought them inside on the screened lanai. So far I’ve picked two predators off of each plant, after which we’ve seen no more. There are some brown spots on the undersides of some of the leaves. But most of the cats have survived and are munching away happily. I would post a picture but don’t know how. Hi Cyndy, those predators can be sneaky but it sounds like you were able to detect them before they caused too much damage. If you are starting from seed, growing three in a pot is a great idea. If any leaves look sick/fungusy I would remove them to stop the issue from spreading. Have a great season! I raised and released about 45 Monarchs this past month. The eggs and tiny larva were found on Tropical Milkweed growing in containers in my garden. I put the containers, with their residents, into mesh butterfly enclosures on my screened porch. When a plant was stripped, I moved the larvae to another backup container plant–and kept rotating. (I had about 30 TMW plants at various sizes growing in containers.) This was the first time I had a chance to raise so many. I highly recommend the container gardening concept for Monarchs–and thanks to Tony whose how-to-raise Monarchs has been such an inspiration and source of information. Also, tried with success rooting TMW from cuttings. Hi Joan, thanks for sharing your experience. I am happy to hear you are having so much success…raise on! Tony, I’ve read about milkweed being poisonous. Are there precautions or suggestions you use when working with milkweed? Thanks for your informational website. It’s great! Hi Patricia, I’ve handled milkweed for over 35 years…for much of that time I was not aware of some of the potential hazards. The sap can be a major eye irritant and I’ve heard reports of people making emergency room visits in rare circumstances. Some choose to wear gloves because of this, but I just wash my hands when I’m done handling milkweed and never have had an issue…it’s also a good idea to get out of the habit of rubbing your eyes/face with your hands. Another worry that people have is children and pets. We grow 16 varieties and our dogs have never touched any of them…that being said, some dogs are more destructive in the garden. Same with kids…if you have kids that are taste-testing everything they can find, some precautions might be in order…planting in a region where they don’t have access, planting in pots, using protective barriers like fences. Assess your particular situation, and then take precautions if it makes sense to you. Hope this helps! 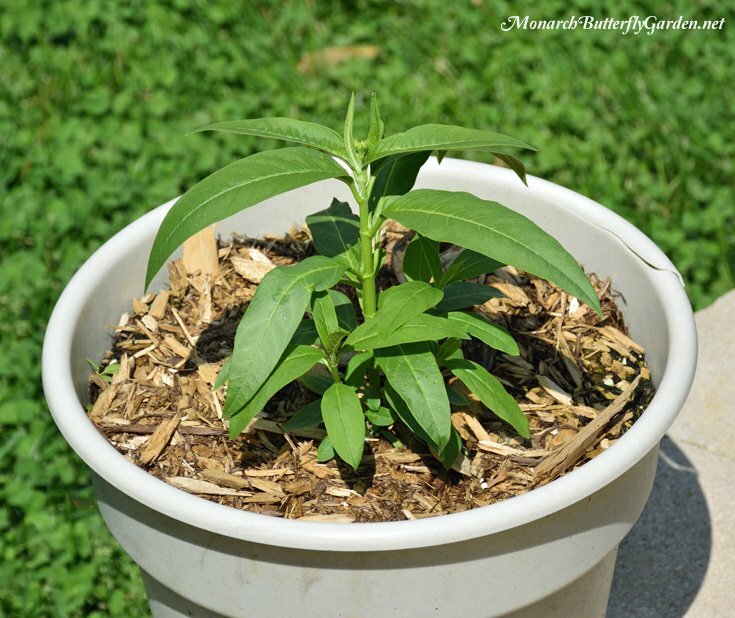 Besides some of those listed above in your article and in the Comments section, I’ve had great success in growing Asclepias speciosa ‘Davis’ and Asclepias fascicularis in containers. Haven’t had too good of luck with Asclepias eriocarpa though, as from what I’ve read up on it, A. eriocarpa is highly xeric and develops a long tap root that resents being cooped up in a pot. The two out of 30+ I started from seed last year are barely hanging in there. If they survive and grow to be fairly strong, I’ll donate them to a friend of mine who owns 5 acres where A. eriocarpa is native. He doesn’t have any growing on his, but hopefully he will soon! Since I live in a mobile home park where all of my “garden” is comprised of cacti and succulents with a mulch of landscape fabric, pebbles and a few large rocks placed here and there, all of my butterfly plants are raised in pots of various sizes and compositions. Thank you for sharing your experience with some of the western natives…this is always helpful since we don’t hear as much about them. We do grow the common version of speciosa (in our Minnesota garden) and the patch looks very promising so far. It sounds like container has allowed your butterfly garden to thrive in spite of poor soil conditions. How many milkweeds can we put in one pot? And can we mix them together? Hi Helen, that would depend on how large your container is and how large the plants are. Whatever appeals to you and whatever works…you might also want to try mixing a milkweed plant/nectar flower in the same pot. I always buy a 12″ or larger and reuse the ones I get from nurseries when I buy from them and I also take from the curb on garbage day why through them out if they aren’t cracked right of course I wash out real good before I use them. And thanks for the idea of mixing host with nectar. My tropical milkweed is moving along and I have common milkweed but I thing my common is too young to flower this year . But I bought the family jewels and showy,purple ! I live in Thousand Oaks California. I have 10 Milkweed plants in all. 2 in Containers and 8 in my garden. Plus Lavender and many other plants which attract Monarchs and Hummers. Mine in both places are doing great. I also have on average 50 mixed butterflies everyday. Happy Gardening! Your garden sounds like a smashing success Gary…thanks for sharing and have a great season with your milkweed and monarchs! I have had swamp milkweed in the garden for two years now. This past year I thought I would save some seeds and put them in pots just to see if any would come up. I planted them last October and now I have plenty of them in the pot I planted them in. I will need to thin them out but wow, I didn’t expect so many to sprout up. Thanks for all your ideas Tony. Tropical milkweed has been blooming on our windowsill most of the winter. We have had great success with it in pots for many years. Migrating fall monarchs have visited the flowers on a 3rd floor deck. We grew dozens of them last spring and gave many away to neighbors who kept them potted on balconies. sounds like you are set to have a fantastic season Tracy…good luck! I started a couple of clumps of swamp milkweed in a very large pot last summer. By the Fall, I had three decent sized clumps. However, all died over the winter. I suspect being outside over the winter was too much for them. Kicking myself that I didn’t move the pot into my garage. But I’m not sure even if they would have survived had I put them inside the garage. I’m located in northern Iowa. So the likelihood of winter kill of milkweed planted in pots is something to consider if you live in cold winter climate zones. Yep, I have plenty more in my yard so no worries. and swamp and showy milkweeds seeds which I will start this fall in the ground with milk jug covered protection.